Author(s): Alice F. Muggen, Simar P. Singh, Rudi W. Hendriks, Department of Pulmonary Medicine, Erasmus MC, Rotterdam, The Netherlands. Anton W. Langerak. Various signal transduction pathways have been implicated in the pathogenesis of chronic lymphocytic leukemia (CLL), which is characterized by the progressive accumulation of monoclonal CD5+ B cells in the blood. B cell receptor (BCR) signaling appears to have a crucial role in disease onset and is thought to be induced by self or non-self-antigen recognition leading to chronic stimulation. Several of the kinases functioning downstream of the BCR are aberrantly expressed or constitutively activated in CLL. Yet, these kinases have additional roles, particularly in chemokine receptor signaling, which is essential for homing and survival of CLL cells in lymphoid organs, or in toll-like receptor signaling. Recently, small molecule inhibitors of kinases in the BCR signaling pathway have shown impressive anti-tumor activity in clinical trials. Remarkably, the observed durable responses in CLL patients were accompanied by transient increases in blood lymphocyte numbers, indicating the importance of these kinases in chemokine receptor signaling. In this review, we therefore highlight the role of BCR signaling and the important other associated signal transduction cascades for CLL cells and give an overview of novel agents that target these specific pathways and were shown to be successful for CLL treatment in clinical trials. Keywords: B cell receptor, BTK, Chronic lymphocytic leukemia, kinase inhibitors, signal transduction. Affiliation:Department of Pulmonary Medicine, Erasmus MC, Rotterdam, The Netherlands. Keywords:B cell receptor, BTK, Chronic lymphocytic leukemia, kinase inhibitors, signal transduction. Abstract:Various signal transduction pathways have been implicated in the pathogenesis of chronic lymphocytic leukemia (CLL), which is characterized by the progressive accumulation of monoclonal CD5+ B cells in the blood. B cell receptor (BCR) signaling appears to have a crucial role in disease onset and is thought to be induced by self or non-self-antigen recognition leading to chronic stimulation. Several of the kinases functioning downstream of the BCR are aberrantly expressed or constitutively activated in CLL. Yet, these kinases have additional roles, particularly in chemokine receptor signaling, which is essential for homing and survival of CLL cells in lymphoid organs, or in toll-like receptor signaling. Recently, small molecule inhibitors of kinases in the BCR signaling pathway have shown impressive anti-tumor activity in clinical trials. Remarkably, the observed durable responses in CLL patients were accompanied by transient increases in blood lymphocyte numbers, indicating the importance of these kinases in chemokine receptor signaling. 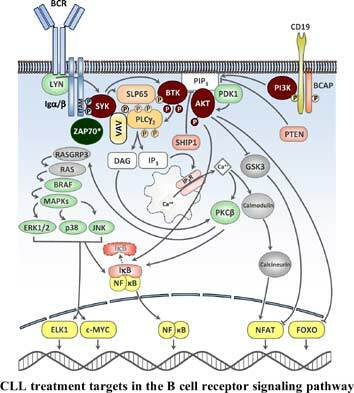 In this review, we therefore highlight the role of BCR signaling and the important other associated signal transduction cascades for CLL cells and give an overview of novel agents that target these specific pathways and were shown to be successful for CLL treatment in clinical trials.